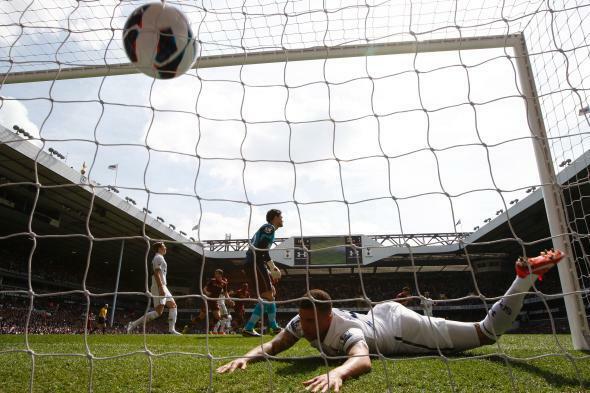 English Premier League plans to scour social media, issue take-down notices for goal videos. Don’t you dare post video of this goal to Vine. Around the world, professional sports leagues are beginning to see certain social media posts in a new light: lost profits. And for smartphone-wielding fans hoping to capture a historic goal or a game-winning home run from their spot in the stands, things are about to change. A spokesperson from the U.K.’s English Premier League announced this week that the soccer behemoth is developing new technologies to scour the Web for video content taken at matches and issue takedown requests in their wake. The reason behind it may seem unfair at first, but it’s not personal. It’s business. In an interview this week with BBC’s Newsbeat, English Premier League director of communications Dan Johnson explained that the new crawlers will start by detecting videos of goals scored at the league’s soccer matches. A crawler is an automated program that continually browses certain Web pages, indexing its findings along the way. Those being used by the EPL will first set their sights on social media sites including Vine. Crawler algorithms may also be modified to focus on specific file types or content. Inasmuch, the EPL also announced that they plan to target GIFs, a not-so-subtle swipe at sports-GIF forums on sites like Reddit. “I know it sounds as if we’re killjoys but we have to protect our intellectual property,” explained Johnson. Fans may not see the harm in sharing a goal online with friends. After all, they paid good money to go to the match and presumably want to boast that they were there. (If you’ve ever stayed at home during an epic playoffs matchup while a friend tweets photos from the big game, you know that sports FOMO is the worst FOMO.) But broadcasters are paying a whole lot more than the price of a seat: In 2012, Sky Sports and BT Sport agreed to a three-year, $4.86 billion broadcasting contract with the Premier League. In the United States, NBC Sports chipped in a measly $250 million for the same content rights. But that’s not all! U.K. newspapers the Sun and the Times (both owned by Rupert Murdoch’s News UK) purchased the online content rights to Premier League matches for a little more than $50 million. For a weekly subscription fee, Sun+ users can access every goal from their computers and mobile devices. (Never mind that some of those devices are banned at pro sports stadiums.) And like many other professional sports leagues, the English Premier League is very clear about its copyright infringement policies. In the United States, Major League Baseball is notorious for its fierce protection of its copyrights. Rules regarding photography and videography vary widely from park to park, but almost all of them are very clear about distributing said content. While stadium selfies probably won’t be targeted, they’re still (technically) fair game if MLB believes they’re infringing on their copyright. In other words, the days where making your friends green with envy by posting video of a game-winning home run/goal/touchdown/basket may be drawing to a close. New technology will continue to make it more difficult, and blockbuster broadcast deals will only hasten that process. But maybe that’s for the better. Sports—like meals, movies, museums, and concerts—are best enjoyed free from our digital tethers. Imagine a critical at-bat uninterrupted by hordes of uplifted iPhones. Imagine the sheer joy of a 100-plus-yard kick return, unadulterated by your smartphone screen. Then imagine paying $5 to see it again afterward. Who said you could have your cake and eat it too?